"Oh. Thank Goodness. It was a dream." "Umm... Not this time, Mister Spirit." Haha, dear, dear Chris Samnee! It can be a rough-and-tumble world, fighting crime. Under a sensual, bold and beautiful Becky Cloonan cover, this 12-page anthology of 10 self-contained stories is a breath-taking, broadsheet-sized spectacle at a whopping 23" x 14.5" or 58 x 27 cm. With love, respect and a great deal of grin-inducing wit, a stunning array of top-tier international comicbook creators celebrate the centenary of the birth of Will Eisner (1917-2017) in a project instigated by John McShane and LICAF itself, then directed and edited by Festival Patron Sean Phillips, artist on KILL OR BE KILLED, CRIMINAL, USER, THE FADE OUT, FATALE and so much more. I don't know if it's wholly inappropriate to note that Sean also paid for its printing from his own pocket, but I am my own editor, and so I do so. 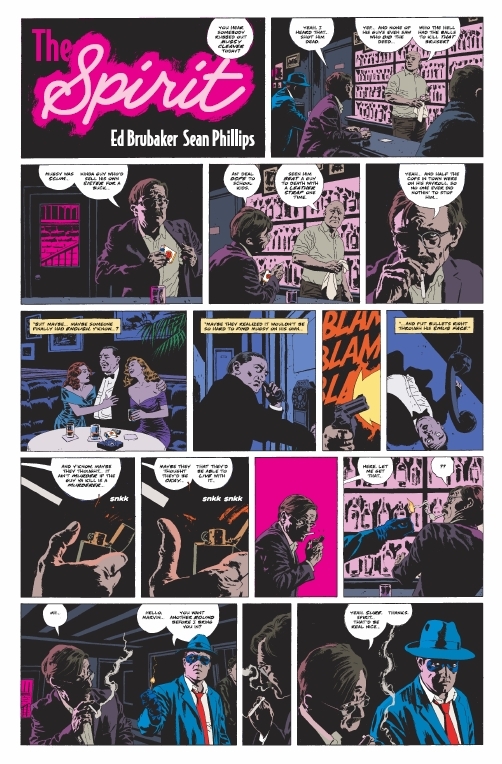 Sean provides a full page here along with his co-conspirator on the above, Ed Brubaker. It is as subtle as you'd imagine. It is so subtle that you will need to read it with your eyes peeled at least twice to spy what The Spirits spots on Marvin to make him such an obvious suspect in the killing of sadistic (so not much missed) crime lord Mugsy Cleaver. The Spirit takes his time and does our Zippo-dead Marvin a favour. After all, Marvin has done us all one of those. 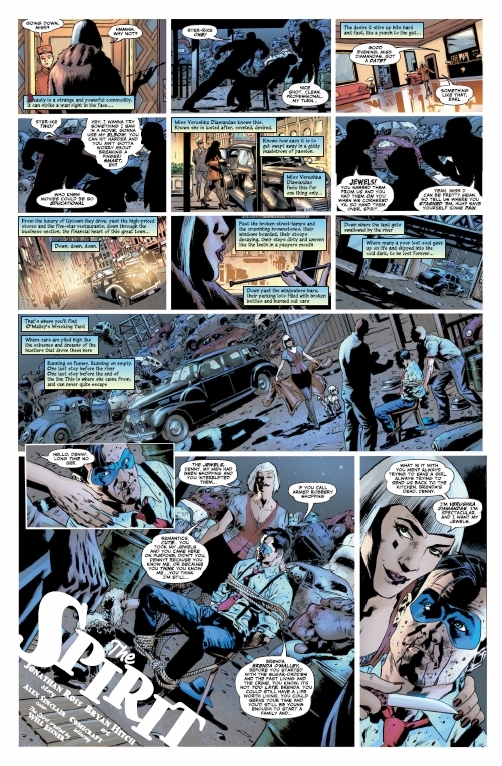 Honour, justice, care and compassion: that was Will Eisner through and through. Ever since our beardly beloved Mark first introduced me to Eisner in the form TO THE HEART OF THE STORM, I have relished the humanity, wisdom, dexterity and integrity of this humble, sequential-art giant who remains the comicbook king of gesticulation. 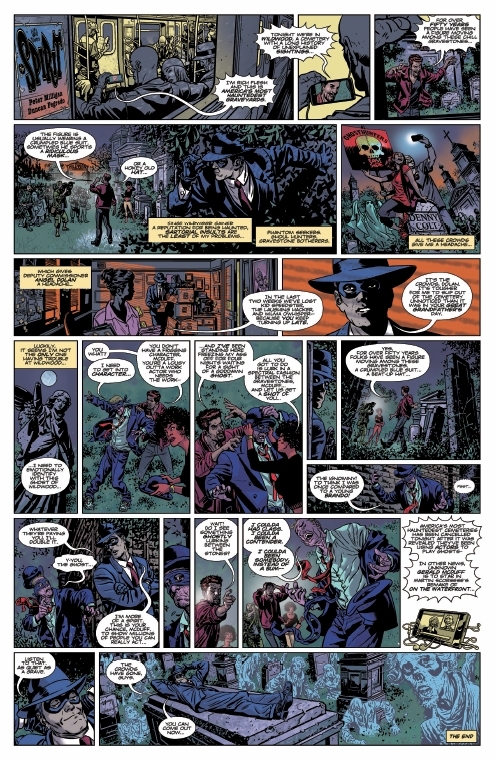 I don't have many true heroes in life: Rosa Parks, MARCH's Congressman John Lewis and Will Eisner - I think that's about it - so I would please urge you at your leisure to pop Will Eisner into our search engine to explore the breadth of his non-genre fiction. I do believe that I have reviewed every single one of his graphic novels, some at great length... except for THE SPIRIT. I confess that THE SPIRIT is a mystery to me apart from its iconic incorporation of titles into the very environment of its opening splash pages. Those I have relished for hours. But if, like me, you are new to the character and are buying this to see all the love lavished upon him by some of your favourite contemporary creators, then we are in the same boat! It is completely accessible, I assure you. 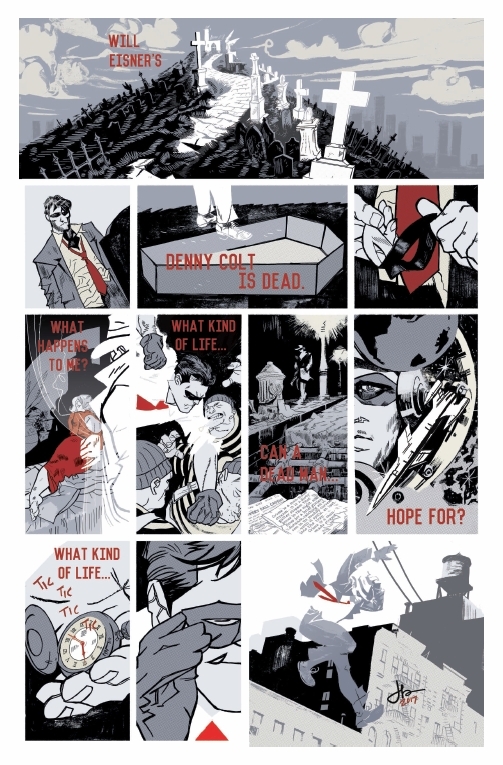 Part of the art of the single-page story, it strikes me, is a good, old-fashioned, unexpected twist, either within the tale itself or - in a homage - on whatever it is a tribute to. ENIGMA's Peter Milligan and Duncan Fegredo provide both! It took me a full three panels to realise that we've fast-forwarded to the 21st Century because I am a complete and utter moron. It's there, right in the opening shot of a subway-train passenger who is accessing - via his mobile phone - one of those ghost-hunting TV-host twerps, grandstanding away in a graveyard. "The figure is usually wearing a crumpled blue suite. Sometimes he sports and ridiculous mask... or a hokey old hat..."
Nice! Unlike that preposterous, self-serving charlatan, attention-seeking is the last thing on The Spirit's agenda. "Since Wildwood gained a reputation for being haunted, sartorial insults are the least of my problems..."
He needs anonymity, plus peace and quiet to slip in and out of his home swiftly, unnoticed, or he could miss his opportunity to apprehend. Instead he's had to skulk in the shadows and dart circuitously from one ivy-strewn gravestone to another to keep undercover. Still, if there's one thing that The Spirit is adroit at, it's using whatever's to hand in order to solve his problems - even if whatever's to hand is the problem itself. Oh, so many twists are in store! Jonathan Ross (yes, that Jonathan Ross) and Bryan Hitch give it their all. Truly there is no stinting. Ross takes on Miss Verushka Diamandas - the very essence of sybaritic, oh so supposed insouciance - and peels her back to her bleached, back-street, wrecking-yard roots. But she simply refuses to submit. If you relish the scale and neo-classical figure work as much as I do of Bryan Hitch (THE AUTHORITY plus THE ULTIMATES SEASON ONE and THE ULTIMATES SEASON TWO, my favourite socio-political superhero comics of all time - yes, including that one! ), then you are in for a treat. "I'm Verushka Diamandas. And I want my jewels." 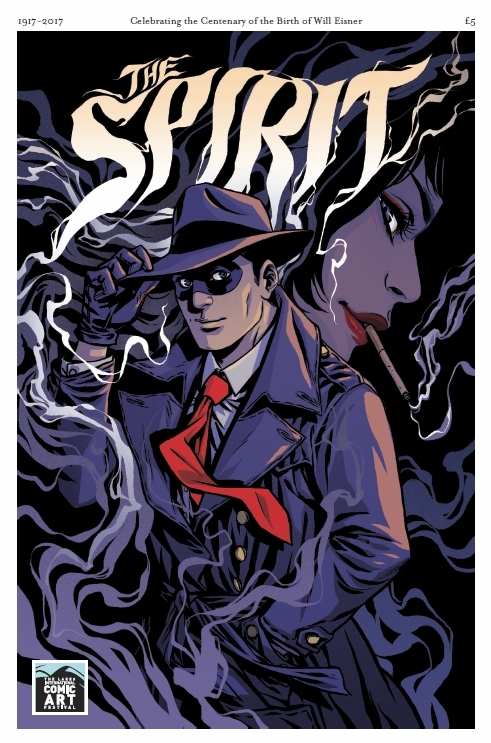 I'm not so sure that The Spirit is. I think he's in for more of a gulp. ROGAN GOSH's Brendan McCarthy brings a softer brand of his customary psychedelic swirls of colours to bear on a tremendously moving and affirmative clarion call from the afterlife into action, and you might notice an addition to his blue suit. Loved it! Seth is more solemn and as quiet as a mouse. He focuses on the buildings and topography of Central City, as you might expect from the creator of GEORGE SPROTT etc. The last two panels say it all. Very sad, that. By contrast, you just know that Sergio Aragonés is going to make you howl, but he leaves it until the very last minute for maximum impact and the chap checking his watch is a triumph. Irreverent? Of course it is! This is the co-creator of GROO - and there's a clue! "Blyth seafront... The biggest magnet for every lawless hood, crook and lowlife in the North East. Except perhaps Sunderland. And some parts of Middlesbrough." Of course Britain's Spirit is going to be bonkers - bonkers, and a bit BEANO. You'll be in for a completely different twist from John M Burns (2000 AD'S GREATEST etc) which is ever so contemporary and cool. Such delicious figure work there, with his unmistakeably rich, old-school colour palette. Finally, Jason Latour (LOOSE ENDS etc) goes for more of a montage effect, breaking the collection up brilliantly, nailing Will Eisner's rain, displaying his broad knowledge of Eisner's legacy outside of the obvious, making his Spirit ethereal but the very opposite of ephemeral. Oh yes, sorry: proceeds from sales will go to LICAF's Creators' Development Fund. Which is cool!